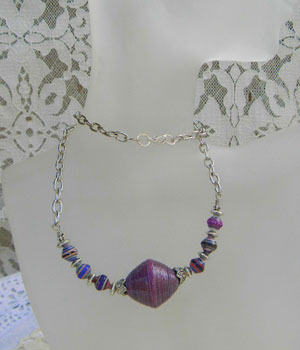 The focal point in this necklace is a purple bicone, accented with small round paper beads with swirls of purple. This is a very feminine look that will look great with white sundresses. 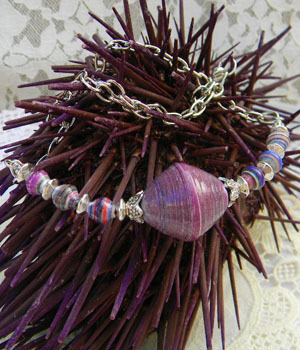 The color in this bead was actually printed into recycled printing paper. I love the silky look to this bead! How do you make that thing so huge and round? Bravo, Love the color, the way it was displayed and just the talent it takes to make it. i love this silky look too ! !the assembly of this necklace with this big diamond shaped paper bead on this chain is very successful … bravo for this beautiful idea Janice!